1. Place the cider in a large saucepan set over medium heat, and heat until it is warmed through. 2. While the cider is heating, melt the butter in a large, heavy saucepan set over medium heat. When melted, add the sugar and stir about a minute. (The sugar will not be completely dissolved,.) Add the warm cider and stir until all the sugar has dissolved into the liquid. 4. 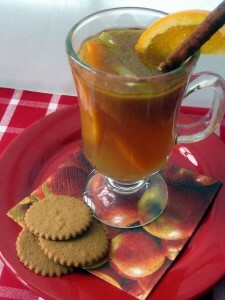 To serve, ladle warm cider into mugs or cups. Garnish each serving with an orange slice and a cinnamon stick. Serves 10. This entry was posted in 2010 Recipes, Beverages, Recipe Pantry, Uncategorized and tagged cider, spiced, warm, winter by brosbottom. Bookmark the permalink.